Cardiff Blues talisman Xavier Rush is undecided on his long-term future as the former New Zealand number eight considers a move to Japan. BBC Sport understands the 32-year-old could leave this summer after his fifth season at the Blues. "I haven't ruled anything out," said Rush. "Once I hear from all the options I can make a decent decision." Dai Young must cut his quota of non-Welsh qualified players in the Blues squad by one for next season. Scotland fly-half Dan Parks' summer arrival from Glasgow will make it seven foreigners in the Blues squad - and former skipper Rush could be the player to leave. "We're at that time of the year where contracts are up for renewal," Rush told BBC Sport. "So it is a case of having a look at some options out there and making a decision once all of the cards are on the table." Rush won eight All Black caps and captained the Auckland Blues to the Super 12 title in 2003. Rush, who has played more than 100 appearances for the Welsh region five years ago, captained the side and was influential in their EDF Energy Anglo-Welsh Cup triumph last season and their march to the semi-finals of the Heineken Cup. 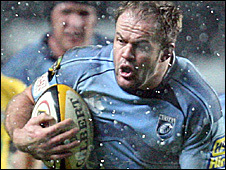 He joined from Auckland Blues for the 2005-06 season and made a huge impact on the misfiring region with his powerful ball-carrying and gutsy attitude.